I am extremely pleased to announce that Chris Beck has done a piece on my work at her blog Brush Paper Water. 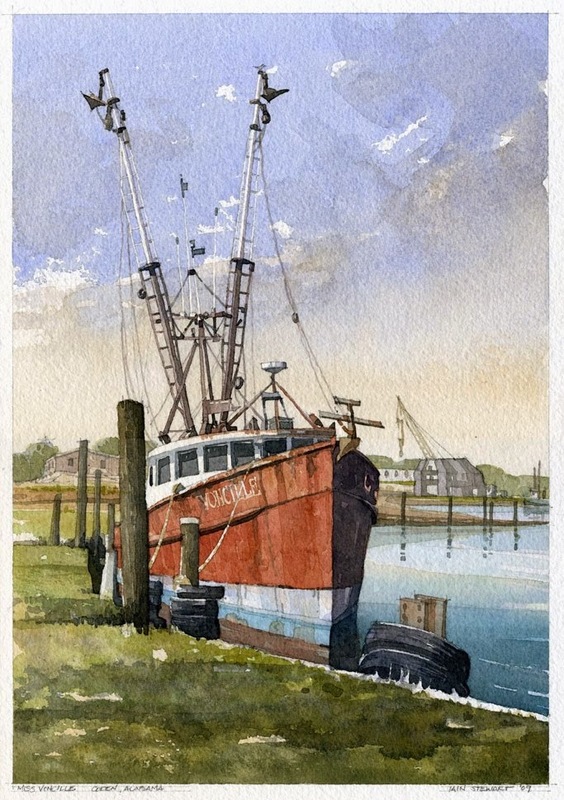 It's a great source for seeing new work from many of the finest watercolorists working today. Thank you Chris! Take some time to look over some of the past artists and definitely check out Chris' work too. Early Evening, Opelika, Alabama, 9" x 13"
"The act of painting, for me, is chicken soup on a cold day. It's my comfort food and my peace. When I am relaxed and the washes are flowing, ideas are clicking, I forget the clock and I am me." Growing up the son of a watercolorist formed the way Iain Stewart sees the world by breaking it down into washes, values, shapes, contrasts, lines and brushstrokes, and his father has had a great influence on his growth as an artist -- perhaps more by example than direct instruction. Iain's background in architecture added a love of built forms and his education at the Rural Studio under the late Samuel Mockbee helped him understand the simple beauty of the rural south. 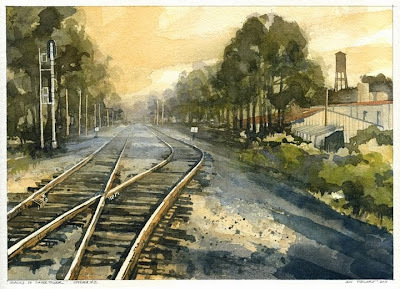 Living in Opelika, Alabama, a railroad town where the remnants of the past are easily visible, he seeks out the places in his daily life that have not completely lost their history, exploring the beauty in the mundane. He is intrigued by the play between rigid and loose and strives to find a balance between the two in his painting -- anchoring his landscapes with something solid or man-made, or varying his brushstrokes to break up the rigidity of architectural forms. 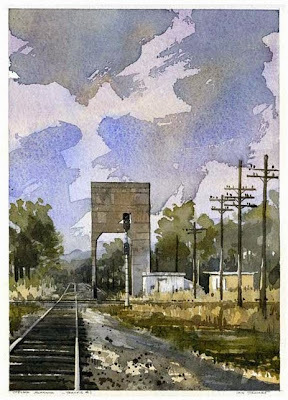 Coaling Tower, Opelika, Alabama, 13" x 9"
Iain is a native of Scotland who received his degree in Architecture from Auburn University and did thesis work at the Rural Studio in Hale County, Alabama. 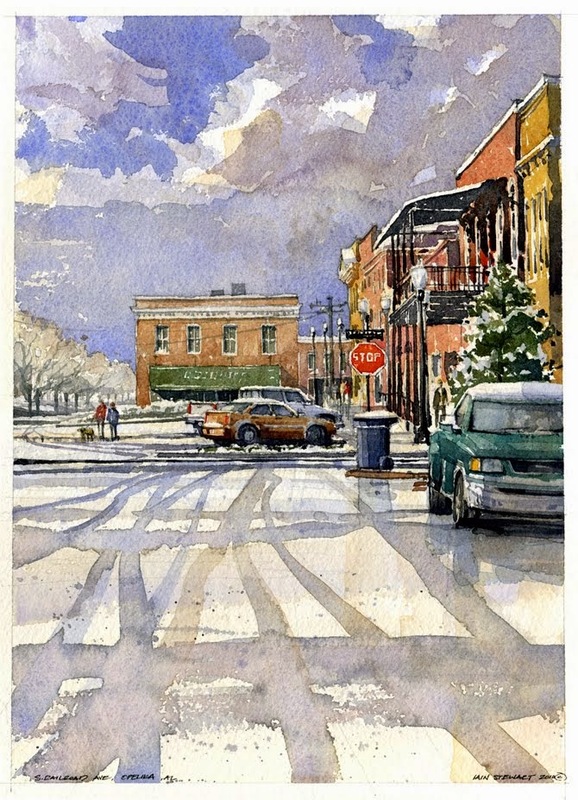 He's been painting in watercolor for over 20 years and, after working as a residential architect, established his architectural illustration business in 1996 as a way to combine his love of watercolor and design. His architectural illustrations have been reproduced in many publications, including Better Homes and Gardens, The Robb Report, Coastal Living, Inspired House, and Southern Living. Frustrated with the constraints of commercial work, Iain renewed his interest in fine art in recent years and has started showing his work in national shows. He won the the Southern Watercolor Society Award at the Watercolor Society of Alabama's 69th National Exhibition this year and was recently named one of Watercolor Artist magazine's "Ones to Watch" for 2010, to be published in the December issue of the magazine (available in October). 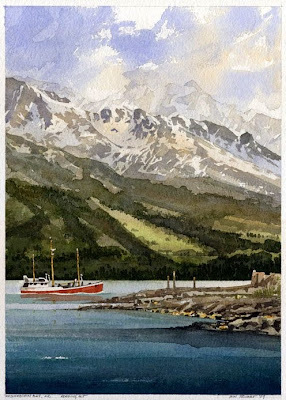 Miss Voncille, Coden, Alabama, 13" x 9"
Heading Out, Resurrection Bay, Alaska, 13" x 9"
Please jump to Iain's blog for more news about his work and a link to his website. Ian , me gustan Mucho Estós Trabajos , Muy Limpios , y enhorabuena , un saludo . Just found your work on Brush - Paper - Water and I'm already such a big fan. Can't wait to follow your work! especially loved the sense of depth, light, and vastness in these works.. Thank you all so very much for the kind words. They really charge me up for a long day.